1 C None No Power Seat 1 C is a standard Azul Space seat which offers extra legroom. However, the proximity to the lavatory and the galley might be bothersome. There is no floor storage during take off and landing. 1 D None No Power Seat 1 D is a standard Azul Space seat which offers extra legroom. However, the proximity to the lavatory and the galley might be bothersome. There is no floor storage during take off and landing. 13 A None No Power Seat 13 A is a standard Economy Class seat, however, this seat does not recline due to the exit row behind. 13 B None No Power Seat 13 B is a standard Economy Class seat, however, this seat does not recline due to the exit row behind. 13 C None No Power Seat 13 C is a standard Economy Class seat, however, this seat does not recline due to the exit row behind. 13 D None No Power Seat 13 D is a standard Economy Class seat, however, this seat does not recline due to the exit row behind. 14 A None No Power Seat 14 A is a standard Azul Space seat located at the exit row with additional legroom. 14 B None No Power Seat 14 B is a standard Azul Space seat located at the exit row with additional legroom. 14 C None No Power Seat 14 C is a standard Azul Space seat located at the exit row with additional legroom. 14 D None No Power Seat 14 D is a standard Azul Space seat located at the exit row with additional legroom. 2 A None No Power Seat 2 A is a standard Azul Space seat which offers extra legroom. However, the bulkhead might limit the legroom. There is no floor storage during take off and landing. 2 B None No Power Seat 2 B is a standard Azul Space seat which offers extra legroom. However, the bulkhead might limit the legroom. There is no floor storage during take off and landing. 2 C None No Power Seat 2 C is a standard Azul Space seat which offers extra legroom. 2 D None No Power Seat 2 D is a standard Azul Space seat which offers extra legroom. 29 B None No Power Seat 29 B is a standard Economy Class seat. The proximity to the lavatory and the galley might be bothersome. 29 C None No Power Seat 29 C is a standard Economy Class seat. The proximity to the lavatory and the galley might be bothersome. 3 A None No Power Seat 3 A is a standard Azul Space seat which offers extra legroom. 3 B None No Power Seat 3 B is a standard Azul Space seat which offers extra legroom. 3 C None No Power Seat 3 C is a standard Azul Space seat which offers extra legroom. 3 D None No Power Seat 3 D is a standard Azul Space seat which offers extra legroom. 30 A None No Power Seat 30 A is a standard Economy Class seat. This seat is in the last row and does not recline. The proximity to the lavatory and the galley might be bothersome. 30 B None No Power Seat 30 B is a standard Economy Class seat. This seat is in the last row and does not recline. The proximity to the lavatory and the galley might be bothersome. 30 C None No Power Seat 30 C is a standard Economy Class seat. This seat is in the last row and does not recline. The proximity to the lavatory and the galley might be bothersome. 30 D None No Power Seat 30 D is a standard Economy Class seat. This seat is in the last row and does not recline. The proximity to the lavatory and the galley might be bothersome. 4 A None No Power Seat 4 A is a standard Azul Space seat which offers extra legroom. 4 B None No Power Seat 4 B is a standard Azul Space seat which offers extra legroom. 4 C None No Power Seat 4 C is a standard Azul Space seat which offers extra legroom. 4 D None No Power Seat 4 D is a standard Azul Space seat which offers extra legroom. 5 A None No Power Seat 5 A is a standard Azul Space seat which offers extra legroom. 5 B None No Power Seat 5 B is a standard Azul Space seat which offers extra legroom. 5 C None No Power Seat 5 C is a standard Azul Space seat which offers extra legroom. 5 D None No Power Seat 5 D is a standard Azul Space seat which offers extra legroom. Azul provides access to music through its seatback inflight entertainment system. Azul provides access to 48 live SKY channels and 9 channels of recorded programming. Azul provides complimentary beverages and a large assortment of snacks. Azul's E-195 offers two by two leather seating and individual inflight entertainment monitors at every seat. Azul was the first airline in Latin America to feature inflight entertainment monitors at every seat on all of its jets. Seating on Azul's E-195 includes 96 regular economy and 22 Azul Space seats providing an additional 3 in/8 cm legroom for an added fee. 1c and 1d does not have an overhead bin as it is reserved for some airline kits and crew bags. Good seat even front of the wing and next to turbine, which by the way is not so loud. This seat are OK, with a common space to reclining and the legroom. 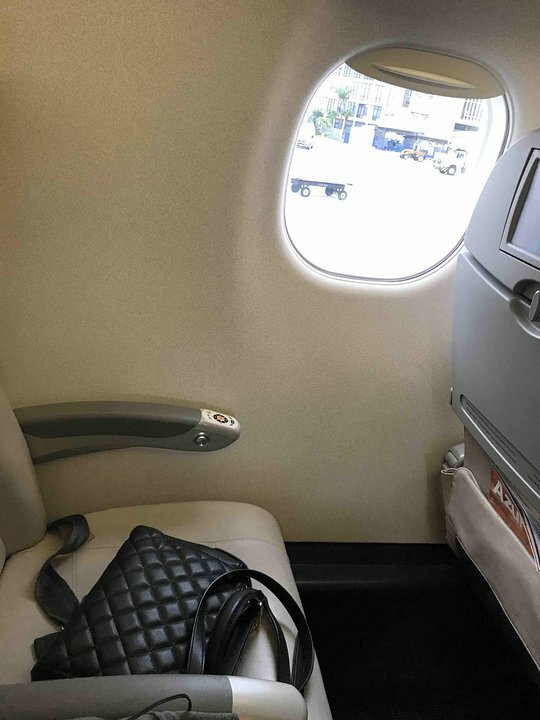 This seat will be ideal for who wants to take pictures of the sky without losing part of the wing too. A tip, ask for the earphone as soon as you entry in the airplane, because you can search and enjoy channels on the screen right at the beginning of the flight before the board assistant starts to deliver the amenities. Azul flies 1 versions of Embraer 195.